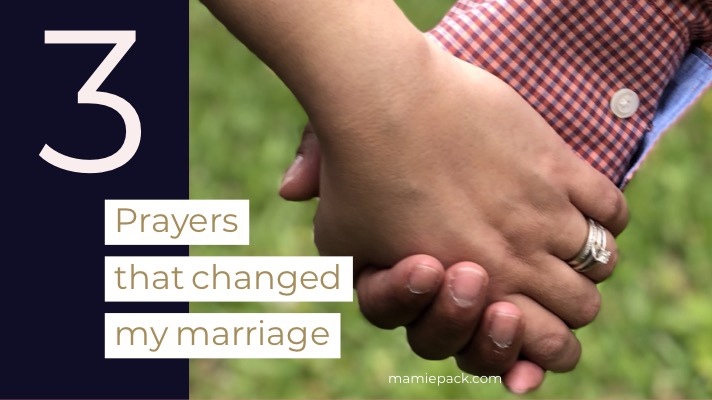 As my husband and I celebrate our 14th wedding anniversary, I thought I would share with you three prayers that have changed our marriage. Instead of my usually written blog, I though I would try something new–a vlog. I hope you enjoy and that you would share with others. Sign up here to receive your own 20 days to a healthy marriage. How do you pray for your husband? I am an Army wife and I pray for my husband’s mind. He has been deployed numerous times and I ask God to guard his mind. Absolutely Faith!!! That is so important. Love your vlog! Congratulations on your 14th wedding anniversary! Oh, thank you! Glad you enjoyed it. That’s great! I should take some of these things to my own marriage. I know sometimes my husband feels bombarded when I need to ask a thousand questions about his day. Yes!!!!! Let me know how it works out for you. I love the vlog! What a great idea! Happy anniversary! Oh, thanks. Trying to embrace stepping out of my comfort zone! Congrats on 14 yrs! Such a milestone!! Congratulations on 14 years! Beautiful prayers I will start to say myself. Getting me out of my “prayer rut”. I do not follow religion or prayers but your advice is great for any relationship. I love what you said about communicating about their day, for husbands and sons. Sometimes I find when I ask they just get annoyed and my husband feels I’m nagging and you’re right, with time they talk on their own. Thank you for your kind words. I am glad you were able to find this helpful. We mean well when we want them to talk with us, but how we do it actually works against building the very relationships we are trying to build. Loved that you did a video. We are very similiar in being communicators constantly and wanting more. You’re right-sometimes it does come off pushy! This video was an eye opener. I’m new to the marriage game and I admire your strength and commitment. Thank you for the inspiration. Prayer goes a long way. I just always prayed for protection and guidance. ❤️Prayers can be answers in all forms- such as a video like this. Thank you! Oh, I am so glad you found it helpful. Marriage is such a beautiful gift and prayer helps tremendously. I often had to remind myself that I choose us. This thought helps me to remember that I choose reconciliation.